To avoid ruining the summertime fun and excitement, a beach cart helps to transport all the beach camping equipment effortlessly. These devices are built to quickly push or pull over any terrain including sandy beaches, and the user gets to their destination in a single trip rather than two or three. We have scoured through the congested market and identified the best beach carts you can buy. After reading this in-depth review, you will find it easy to venture into the market and pick the one that suits you. Weight capacity: It is the single most crucial factor. Beach carts have weight limits beyond which you should expect breakage and tear. Ensure the load you intend to carry does not outweigh the maximum capacity of the cart. Material: 600D fabric is the most commonly used fabric for its lightweight, durability and ease of cleaning. For the frame, insist on powder coated frames which can hold up to the salty conditions. This ensures that you enjoy long-term benefits from the beach cart. Design and accessories: Modern carts incorporate advanced design features you may be practical for your case. These include the ability to fold to a beach table for holding drinks and bites. Other models come with cup holders, cell phone holders and umbrella holder. You may want to consider such models if such add-ons are desirable to you. Wheel design: The wheels determine how simply the beach wagon can pull through sand without sinking. Ensure the wheels are thick to enable them to skim across the surface of the sand even with heavy baggage on top. The wheels should preferably be rubber or plastic; these wheels give better traction. Size: Depending on how much you intend to carry, look out for a carriage whose dimensions can meet your demands. Your car trunk will likely be full of gear so you should also consider an option that can readily fold for secure storage. Easy to Store and transport: Beach carts are foldable to a compact size for easy storage and transportation. They are highly versatile: forget the name, beach carts are not only limited to the shores. They can be used to haul anything their capacity allows, on any surface. You can use them for shopping, in your backyard, garden and many more. 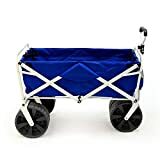 This is the kind of beach cart you need to bring with you on your next excursion if you need orderly and straightforward storage and transportation. The company creatively crafts 600D polyester fabric with powder coated steel to make this cart long-lasting and resistant to elements. You won’t need to assemble this cart, you fold or unfold, and you will be good to go. With a 150 lbs. Weight capacity, you get to carry even your bulkiest belongings and transport little kids and toddlers. 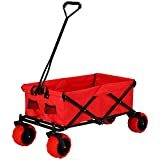 This foldable wagon uses four wheels that are made from highly durable rubber and don’t have to be inflated. It also features a 30” long handle that makes pulling more comfortable and the cart won’t knock your feet. The swivel front wheels ensure there is ease of control. The thick heavy-duty wheels ensure it stays afloat on the sand and increases stability on every kind of surface. 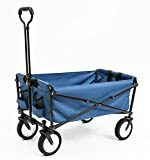 Move you’re your beach gear through sand without too much hardship with this utility wagon from Mac Sports. You don’t move to be making trips to and fro the car with the large 35.5″ x 20″ x 22.5” storage compartment and 150 lbs. Capacity. The 600D fabric shell attaches to durable, heavy-duty frames made from steel with a powder coating to protect it from salt water and tear. The tires are also heavy duty and won’t sink into the soft sand. When you are ready to go home, simply fold it and keep it in the included carry case for easy storage. With the added cup holders, you can be sure that your drink will stay off the ground and so sand won’t get in your drinks. You will also love the telescoping handle that helps achieve great control over rough terrains. It comes fitted with two cup holders by the handle. It can be folded to a table making it even more versatile. Easy haul, easy fold and easy unfold the simple is the description of this useful and compact cart making it the perfect haulier to bring about anywhere. High strength 600D polyester has been paired with a strong steel frame that has been powder coated to make it more durable. The result is a sturdy structure that can handle up to 150 lbs. Allowing children to have fun riding in. The wagon will fold into a small package that should easily fit into any vehicle. The tires have been made with extra tread so they can bite into any terrain you subject them to and glide across effortlessly. There is a fitted handle for towing and easy control of the cart whichever the terrain. You can secure the handle to the position you prefer using a lock mechanism. It has a more spacious luggage compartment that most of its competition. 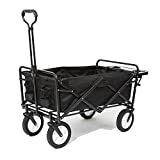 Enjoy carrying around all your families gear with ease courtesy of this multi-terrain wagon cart. It has been designed to fold into a compact package so it can easily fit in the trunk of your car. This cart is built of 600D fabric and heavy-duty frames that can hold up to harsh sun and exposure to salt water. With 150 lbs. of weight capacity and 31.5″ x 21.4″ x 9.7″ size, there is enough space to accommodate all your beach gear. And the usefulness doesn’t end at the beach; the large tires make it suitable for all kinds of surfaces making it convenient for multiple uses. An adjustable handle extends for easy handling with two included cup holders to ensure your drinks are held in place and makes it great for even the tall 5-footers. Extra thick wheels ensure all-terrain use. It includes a carrying case for storage. Get all your gear a place to belong while on the sandy beaches instead of struggling to juggle floats, chairs, coolers and towels while at the beach. This unit boasts top quality material that makes it tough and reliable enough to carry all your gear with ease. The 110-pound weight capacity is impressive 100 with internal dimensions of 35.5″Lx18.4″ Wx12″H. It opens up and folds up in seconds and includes a carry case for convenient storage. 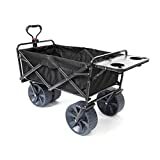 Aside from carrying everything you need, the cart can go virtually anywhere; it has thick wheels that ensure it does not dig into the surface you decide to throw it on. Buyers get to enjoy a one year manufacturer’s warranty. Why hassle with your beach gear during a day out in the sun when you can get enough space to carry all your beach camping equipment at a modest price? With a 150 lbs. 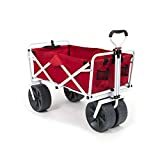 Carrying capacity and 32.7×19.7×20.1 inches space, this cart will make your life easier by accommodating essentially all you ever need on a day out on the beach. 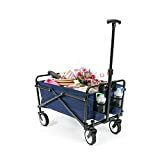 This cart folds flat not to take up any additional room when you want to pack it in the car for a road trip with the family. The long handle allows you to walk upright without banging your feet. The trodden wheels are the reason behind smooth movement over the soft sand of the beach. At this price, it is hard to beat this level of quality. There is a variety of colours to choose from. It is super light at about 10lbs. This cart is all you need to quickly move around all the necessary gear for a day at the beach. This cart allows a generous 150-pound weight capacity so you can bring all the essential gear along with you. The company recommends a maximum of 50 lbs. When used in deep sand. 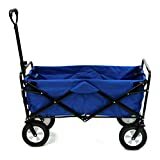 Like other high ranking beach cart, this one folds into a convenient compact unit that takes up virtually no space. The tires are large, so the cart will comfortably make it through any terrain. If you wish to, you can fold this unit into a convenient table, and you will get to enjoy using an included cellphone holder. This cart is sure to enhance luxury and contentment. It features 2 cup holders to secure beverages. The manufacturer provides a free carry case. Enjoy the benefit of carrying all your items in one trip without a backache. Inside the 36.2″ x 21.4″ x 24.59, you have sufficient space to effortlessly move snacks, beach gear and personal items provided they don’t go beyond 150 lbs. It easily folds into position and unfolds to a small piece that can be transported and stored with ease. 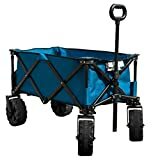 It has large oversized wheels that make the cart more stable for easy transport on all-terrain. They move smoothly on sand meaning that you won’t need much energy pushing the wagon. This dominant brand offers a comfortable handle that attaches two cup holders and a cell phone holder for user convenience. For a more comfortable ride, it is advisable to limit the cart to 50 lbs. If the surface has deep sand. The 600D polyester is a breeze to clean. You need not struggle to move large beach chairs and coolers, just step aside and let this utility wagon do the work for you while you get the most out of your summertime vacation. This unit can hold anything under 150 lbs and folds flat for easy storage and transportation after use. There is a carry case too for storage after use. The cart has been built from heavy-duty materials that are known to take a severe beating. With it you are free to manoeuvre over any surface, this is made possible by the vast trade that can handle any terrain you seek to venture. This unit provides two mesh cup holders for your drinks. The fancy “Beachcomber Macwagon” logo embedded on the surface adds a fashion statement to your gear. Your trip to the beach should allow a time to relax and have a great time with family. Hauling heavy luggage on your back cuts the fun, and that is why you need this capable outdoor utility wagon to do this exhausting task. You simply load everything you need and head to the beach, just be careful it doesn’t weigh over 150 lbs. The durable polyester and strong steel frame ensure maximum strength and durability. It sets up in seconds with no assembly required and when you don’t need it fold it to fit in the included carry case to allow for easy storage. The rubber tread offers smooth mobility and lets you cart it with ease on any terrain. The fabric is simple to clean. The handle features two mesh cup holders. Whenever you have loads to carry, beach carts are the ultimate summer accessory. The standard carts we have looked at are rated as the best beach carts you can buy and will help you get the job done. Get your preferred piece today and get to enjoy what others have been getting all along.